An unusual fruit has come on to the market that is so new it has yet to be given a name. Only available through the high street food chain Marks and Spencer, it is best described as a pear disguised as an apple. 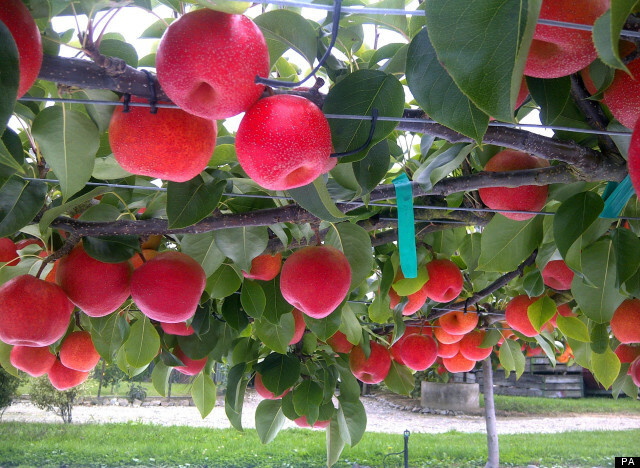 The fruit is popularly dubbed by the media as a "papple", but its official name - for now – is T109. The papple looks similar to and (almost) tastes like an apple, but it has the skin and texture of a pear. However, despite its obvious similarities to an apple, it is not an apple neither is it an apple hybrid. In fact it is no more of an apple than I am! "...this is one of the most exciting new varieties of fruit we have seen for several years. We know our customers like to try new and interesting fruit and we hope this will be something they will really enjoy. It's got a lovely refreshing taste, perfect for snacking on, and a fun alternative to an apple a day..."
The papple is actually a member of the pear family Pyrus pyrifolia, native to China, Japan, and Korea. This new variety was developed in New Zealand and is a cross between European and Asian pear varieties. It is this cross hybridization which resulted in a fruit similar to an apple. What does a papple taste like? Cutting open the papple's thin, orangey red skin will reveal a firm flesh, that drips with juice - as you would expect with a regular pear. The juicy flesh has pear- ish flavors to it, as well as being slightly gritty, and having a collapsing, pear-like consistency. Marks and Spencer state that the papple is has a very apple-like flavor, but I am not convinced, so the best to find out is to pay the £1.00 that the papple retails at and try it out for yourself. Just remember - It has nothing to do with an apple!